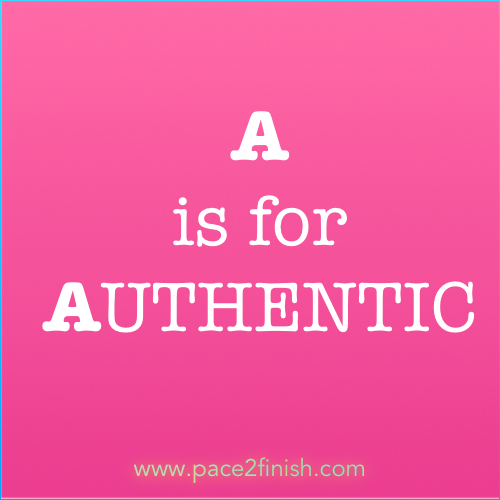 My daughter would tell you A is for Ally, but today A is for authenticity. Yesterday I got a ping from a friend on Facebook. He messaged me three words, “Stay the course.” These three words came at the right time. Have you ever done something knowing it just felt right not knowing where it was taking you? That’s what my writing has done for me. While I fret over words some days and other days they flow, I just know I’m living authentically by connecting with my thoughts, past or present, and writing about those experiences. This is not just a feeling…it’s something I know I should be doing. My writing gives me the space to be authentic, to explore my curiosity, pace my thinking, and prepare a meaningful response/non response. Wow, I’m reaching into my soul and meeting the needs of my inner being. It’s my essence. Pretty powerful stuff, my friend. Sadly we live in a world that fears authenticity. We try too hard to be like others. Why? In our quest to be perfect, humans work super hard to fight who we are. We rubberneck. We watch what others are doing. Instead of discovering who we are, owning it, accepting its beauty, and embracing it, most of spend a lot of our time resisting or procrastinating. We fly our planes low and park our egos into a corner, where it’s safe. Why? Life is about discovering, creating, loving, sharing, laughing, crying, giving and taking. It shouldn’t be about tearing down, and beating up in the name of being real. Love yourself, love others, and learn to embrace difference with respect and dignity. Imagine the world if we turned up with our whole selves every day. Pretty. Freaking. Amazing. 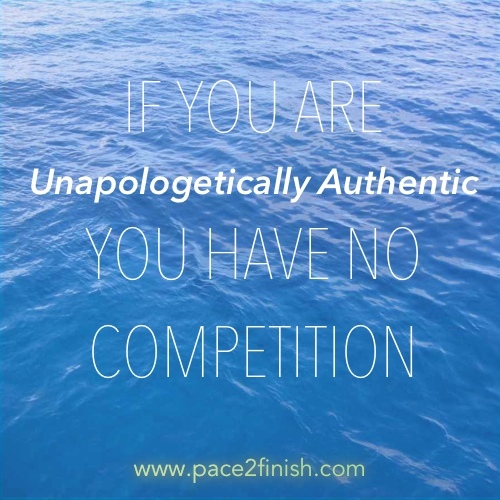 Don’t you owe it to yourself and others to be unapologetically authentic? If you were, you would have no competition! Who are you and what do you stand for? Living authentically is about understanding yourself. And hey, when you really take a hard look at who you are and find out there are a lot of things you aren’t, that’s okay. Don’t beat yourself up. Celebrate this wisdom. There’s nothing more powerful than being able to articulate who you are and where you want to go. What are you putting off and why? My friend, dreams aren’t for children. They are for everyone. What did you want to be when you were younger? What dreams do you have? Are you pursuing them or putting it off? How are you nourishing them? Who is with you? Who needs to go? Too often when we fly our planes low and enjoy our comfort zone, we carry unreal amounts of baggage. And for women, we are notorious for packing everything. Who we bring along is key to how well supported we will be. Have you evaluated your relationships and determined they are still the right ones you need? Are there new ones you need to forge? Remember… extra bags only weigh you down and can cost you precious time. Isn’t it time to fly high, and be the person you were truly created to be? Yep, I think so. Be A for Authentic. If you cannot do it in front of your children (obvious exceptions excluded) it is probably wrong. ‘A’ was great… Can’t wait to find out what ‘B’ is – you are one of the most authentic people I know, both in your writing and in person. Thankyou for always bringing it every day!